Visitors to the new “Constructed Landscapes” exhibit may be surprised to learn that this is the Shelburne Museum’s debut photography show. Though renowned for its collection of folk objects, furniture, quilts, toys and impressionist paintings, the museum has in recent years treated visitors to a variety of modern media, from chandeliers to motorcycles. But not photos. Executive Director Stephan Jost, whose academic focus at the University of Texas at Austin was the history of photography, is delighted to provide yet another first — and a curatorial coup — for the Shelburne: an exhibit in the Webb Gallery of images by famed 20th-century American photographer Ansel Adams (1902-84) and contemporary Canadian photographer Edward Burtynsky (1955-). The sharp contrasts between the two are evident: One captured stunning vistas of the American West in unspoiled condition; the other has photographed sites around the globe that reflect often devastating human impact on the natural world. 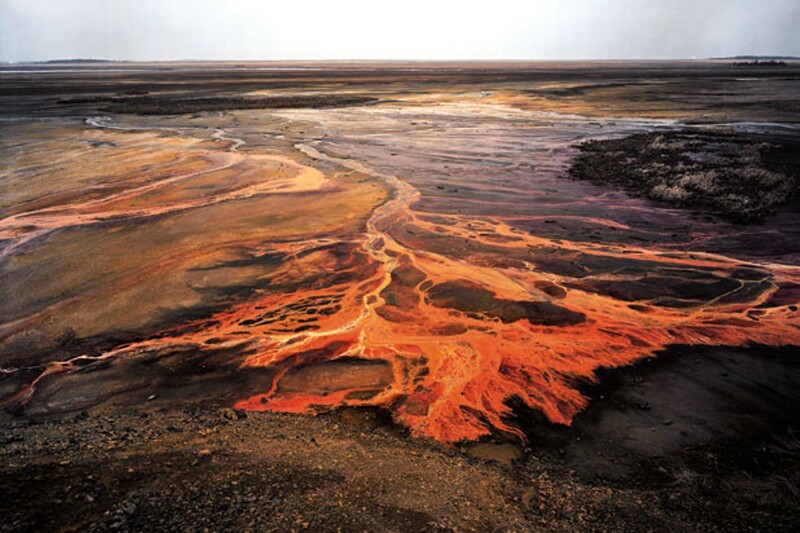 Adams presented his iconic landscapes in black and white; Burtynsky’s are in vivid color. A difference that visitors would not anticipate before entering the Webb Gallery is that Adams printed relatively small — a typical size is just 8 by 10 inches. Many of Burtynsky’s images are measured in feet rather than inches. When Adams was shooting more than half a century ago, points out Jost, no one was working in the kind of scale that is commonplace now. Given that his pictures came to virtually define our collective consciousness of the mountainous West, it’s counterintuitive — in fact, almost jarring — to see this grand scenery in modest proportions. And yet: If Adams’ photos simply represent the custom, and perhaps the printer capacity, of the time, their size and the intimacy of the gallery actually encourage a viewer to closely observe their technical prowess and breathtaking beauty. Jost believes viewers will “come for the Adams and leave talking about Burtynsky.” But there is still plenty to say, and think, about Adams. Anyone who admires black-and-white photography will swoon anew over his bottomless blacks, the veritable rainbow of grays. Adams had a “zone system,” Jost notes, with a “huge tonal range: absolute black and white and every tonal gray in between.” Then there is the piercing clarity and, not least, the compositions. 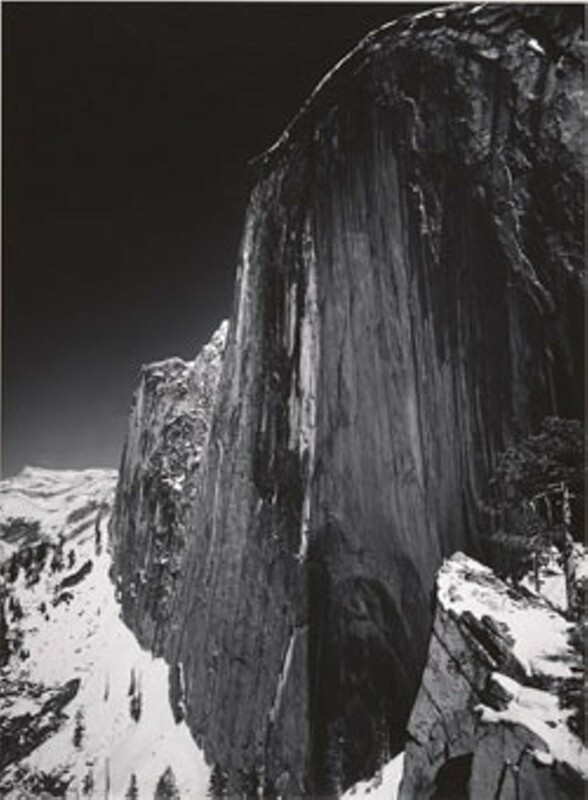 Adams was indisputably a master of his craft, both on site — he took hours to set up his shots — and in the darkroom. Four of the gallery’s rooms are devoted to Adams’ images, and they are arranged exactly as he wanted them — he created portfolios of 12 to 16 photos in groupings largely driven by aesthetic, rather than chronological, considerations, Jost explains. A viewer has the pleasant option of contemplating why Adams chose the prints, and the order, he did. Yet another surprise is the handful of human portraits and architectural studies. After the spectacle of Yosemite, these are strikingly … human. It is sometimes difficult to comprehend the scale — or even the subject matter — of what you’re viewing. In “Nickel Tailings, No. 32,” for instance, a bright orange, toxic-looking substance oozes over a flat plain like lava. The locale turns out to be Sudbury, Ontario, and the orange effluent is leeching from nickel processing in a nearby factory. Only a stand of weeds in the mid-ground provides perspective. In another print, a stack of “densified” — that is, squashed into cubes — oil drums fill the entire image area, and it is impossible to tell how large they are individually, or how many drums there may be. One guesses, a lot. But the image can be seen as a colorful abstraction as much as a symbol of consumption. It would appear that Burtynsky approaches his subjects with two minds: One, obviously, is to document the enormity of the global marketplace — the room with images of grounded ships being dismantled in Bangladesh is a revelation — as well as the enormity of the human population, its voracious appetites and the energy it takes to satisfy them. Consider the diptych of oil derricks outside of Los Angeles, the formidable pyramids of coal near a seaport in China, or even the scored walls of a granite quarry in Barre, Vt. That Burtynsky is successful at conveying this sensibility is apparent; a recent achievement is winning the UK’s And/or 2010 Book Award for Oil, his tome of images depicting humanity’s rapacious hunt for the fossil fuel. 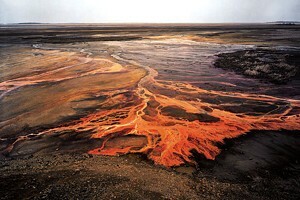 But Burtynsky’s other “mind” is that of an artist: There is no denying that his images are aesthetically potent — in some cases, downright beautiful, in the way that an iridescent oil slick is pretty if you ignore the implicit consequences. Burtynsky is both documentarian and composer, as was Adams. And that explains Jost’s multilayered title for this exhibit: The two photographers have “constructed” their images with extreme care. Much like 19th-century landscape painters before them, the intention of both is to create exceptional pictures and to impart a particular attitude toward the natural world. The pairing of Adams and Burtynsky makes for an exhibit that elicits both awe and sorrow. ”Ansel Adams and Edward Burtynsky: Constructed Landscapes,” Shelburne Museum. Through October 24. Info, 985-3346. www.shelburnemuseum.org.